Cell phones are used as an example on this page. Understanding how non-ionizing radiation frequencies are generated by wired and wireless products, where they are emitted from and how they penetrate the body are very important safety considerations. AegisGuard™ Radiation Shields protect users from near and far field radiation frequencies (RF), regardless of the source, technology, or network communication protocol. The electromagnetic radiation generated by wired and wireless products consist of two elements; non-ionizing radiation frequencies and magnetic fields. Although they are frequently and incorrectly used interchangeably with terms such as EMF, EMF and RF, these elements are different and it is the health effects caused by non-ionizing radiation frequencies fueling the cell phone and power line transformer radiation controversy. This page presents information about the near and far field components of cell phone radiation non-ionizing frequencies. 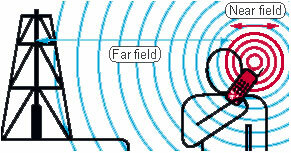 Click here for information about magnetic fields. A cellular phone communicates with a "cell" mast using a radio system consisting of a transmitter, receiver and antenna. Depending upon the design and as depicted by the red areas shown in the phone below, most of the phone serves as the radio system and antenna (click here for additional information about cell phone radio system radiation). At the device level, current cell phone communication operating frequencies are below 2.6 GHz., and the radio waves emitted by the phone itself are referred to as the 'near field.' Although it is the near field non-ionizing radiation responsible for the cell phone health effects reported since 1993, reports addressing health risks at lower frequencies, such as battery and color display emissions, have also been published with increased frequency every year since 2000. (AegisGuard™ (L) Life Series and XP Radiation Shields provide shielding protection from both high and low non-ionizing radiation frequencies). The 'far field' radio waves are the non-ionizing radiation from the cell mast, and while radiation exposure to a cellular phone user is higher from the phone than the mast, far field frequencies of 1.0 THz. (1 trillion Hz., or 1 thousand GHz.) can be generated at the carriers core communication center when fiber is employed. Although cell masts generate their own near and far fields, and most people are never close to its near field, a controversy also exists over the health effects of far field radiation, particularly when within close proximity to people. Since the long term health effects of both near and far field radiation continue to be debated, some scientists believe cellular phones are the largest experiment in history using unwilling test subjects. The transmitter inside your phone periodically sends radio wave signals to the cell mast so that the network knows where you are when a call comes through, and the receiver inside your phone receives the radio wave signals from the cell mast. When you are on a call, the cell mast monitors your phone to ensure it is performing at an optimum power level. If you are out of range or an obstruction is encountered, the cell mast sends a signal to the phone causing it to increase its output power.